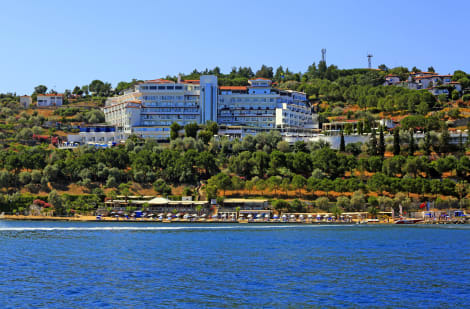 Found on a hillsidewith fantastic views of the turquoise Mediterranean Sea and direct access to the beach, LABRANDA Ephesus Princess Hotelis the perfect place to relax and absorb the culture of the charming Turkish Riviera. The Ephesus Princess is surrounded by a lush green scenery of both pine andpalm trees. It also features an amazing sea view of Pamucak beach and an almost endless blue sky during the warm holiday seasons. 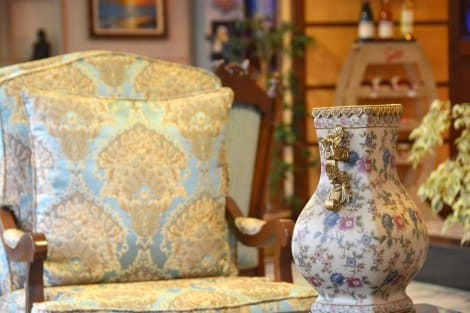 As a guest at our 5-star holiday palace, you will have the chance to experience and indulgeina wide array of luxuries. From high-end onsite restaurants with delicious Turkish and international mealsto world class wellness services and recreation facilities. Feel free to enjoy a late breakfast at our Efes & Gourmet Restaurant after taking an early sea plunge or setup a massage for the afternoonand relax before a decadent meal at one of our many specialty restaurants. Needless to say, the possibilities to relax at our hotel are truly endless. Guests also have an exhaustive list of things to do outside of our hotel grounds. 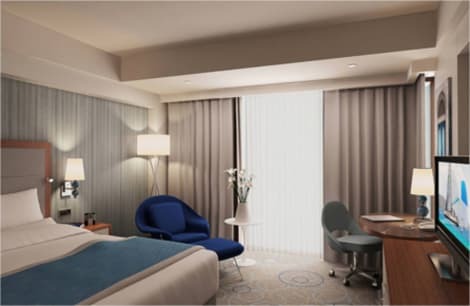 Enjoy warm hospitality and homelike comforts at the DoubleTree by Hilton Hotel Kusadasi. Savor our delicious chocolate chip cookie upon arrival and relax in a stylish guest room or suite. Each guest room features contemporary décor and modern amenities including WiFi and HDTV's. Catch up with work at the spacious work desk with ergonomic chair and enjoy fresh coffee with the in-room coffee and tea facilities. Upgrade to a deluxe room or cottage for extra space and enjoy high ceilings, a sitting area and a private walled garden with whirlpool. For the ultimate luxury, choose our Marina Suite and take in the splendid views of the marina and Aegean Sea from your balcony.Maintain your fitness regime in the 24-hour fitness center or swim laps in the sparkling indoor/outdoor pool. For a more relaxing activity, indulge at the spa, offering a range of luxurious treatments including facials, massage and the traditional Turkish Hamam.Business guests will appreciate our 3 private meeting rooms, all with A/V equipment, ideal for meetings and presentations. 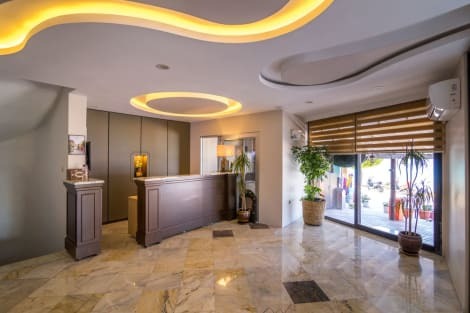 Prepare for your conference in the 24-hour business center or print last minute boarding passes before leaving for the airport.Enjoy delicious local and international cuisine for lunch and dinner at this Kusadasi hotel's tempting onsite restaurant. Ideally located on the rooftop of the hotel, take in spectacular views of the Aegean Sea, while dining on fresh, seasonal dishes and sipping fine wine. At Pak Hotel, enjoy a satisfying meal at the restaurant. Wrap up your day with a drink at the bar/lounge. Buffet breakfasts are available daily from 7:30 AM to 10:30 AM for a fee. Make yourself at home in one of the 24 air-conditioned rooms featuring kitchens. Rooms have private furnished balconies or patios. Complimentary wireless Internet access keeps you connected, and satellite programming is available for your entertainment. Conveniences include desks and separate sitting areas, and housekeeping is provided daily. Hotel has a large lobby. Enjoy a meal at the restaurant or snacks in the coffee shop/café. The hotel also offers room service (during limited hours). Relax with your favorite drink at the bar/lounge or the poolside bar. A complimentary buffet breakfast is served daily from 8 AM to 10 AM. 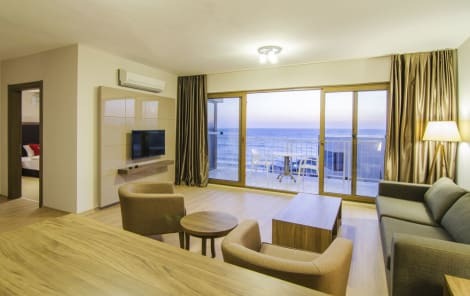 When you stay at Prestige Residence Hotel in Kusadasi, you'll be near the beach, a 4-minute drive from Kusadasi Beach and 8 minutes from Adaland Aquapark. This hotel is 3.9 mi (6.2 km) from Ladies Beach and 8.9 mi (14.4 km) from Ephesus Ruins. Make yourself at home in one of the 35 air-conditioned rooms featuring minibars and LCD televisions. Rooms have private balconies. Complimentary wireless Internet access keeps you connected, and digital programming is available for your entertainment. Private bathrooms with showers feature complimentary toiletries and hair dryers. Make yourself at home in one of the 47 air-conditioned rooms featuring minibars and LED televisions. Your bed comes with down comforters and premium bedding. Rooms have private balconies. Complimentary wireless Internet access keeps you connected, and satellite programming is available for your entertainment. Bathrooms have complimentary toiletries and hair dryers. With a stay at Kayhanbey Otel, you'll be centrally located in Kusadasi, steps from Scala Nuova Shopping Center and within a 10-minute walk of Kaleici Mosque. 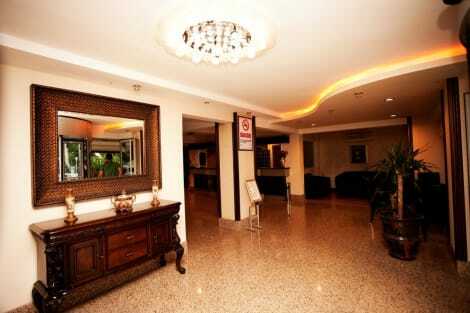 This hotel is 0.2 mi (0.4 km) from Kusadasi Castle and 0.8 mi (1.4 km) from Kusadasi Beach. Featured amenities include express check-in, complimentary newspapers in the lobby, and dry cleaning/laundry services. A shuttle from the airport to the hotel is provided for a surcharge (available 24 hours), and free self parking is available onsite. Satisfy your appetite for lunch or dinner at the hotel's restaurant, or stay in and take advantage of the 24-hour room service. Relax with your favorite drink at the bar/lounge or the poolside bar. A complimentary buffet breakfast is served daily from 7 AM to 10 AM. lastminute.com has a fantastic range of hotels in Kusadasi, with everything from cheap hotels to luxurious five star accommodation available. We like to live up to our last minute name so remember you can book any one of our excellent Kusadasi hotels up until midnight and stay the same night.